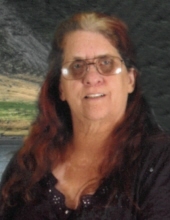 Margaret Rose Eisenauer, daughter of the late Robert Alan and Loretta Jean (Godbehere) Harris, was born June 28, 1958, in Long Beach, California, and departed this life November 11, 2018, at her home in Mountain Grove, Missouri. She was 60 years, 4 months, and 14 days of age. Margaret was united in marriage to Robert Lynn “Ike” Eisenauer on February 16, 1980, in Las Vegas, Nevada. Together, they raised two children: David and Tina. They moved to the Mountain Grove Community in 2012. Margaret enjoyed gardening, knitting, and crocheting and had made many afghans. Her greatest joy was spending time with family, especially her grandchildren. She was very proud to see her granddaughter, Jennifer, graduate high school. Besides her parents, Margaret was preceded in death by her husband, Ike and by one sister, Patricia Harris. She is survived by one son, David Harris of Alton, Illinois, one daughter, Tina Eisenauer of Mountain Grove, three grandchildren, Jennifer Waldren, Joslin “Nickie” Eisenauer, and Kyle Waldren, one sister, Deanna Murray and husband, Bill, of Mission Viejo, California, four brothers, Richard Harris and wife, Beverly, of Glendale, Arizona, Robert Harris Jr. of San Jose, California, Ronald Harris and wife, Patricia, of Mountain Grove, and Randy Harris and wife, Kristine, of Lake Paris, California, many nieces, nephews, great-nieces, and great-nephews, and a host of other relatives and friends. To send flowers or a remembrance gift to the family of Margaret Rose Eisenauer, please visit our Tribute Store. "Email Address" would like to share the life celebration of Margaret Rose Eisenauer. Click on the "link" to go to share a favorite memory or leave a condolence message for the family.